Home TRAVEL ABROAD Asia Destinations China-Thailand 2010 2/14/10 HAPPY CHINESE NEW YEAR & VALENTINES DAY from Chiang Mai Thailand!! 2/14/10 HAPPY CHINESE NEW YEAR & VALENTINES DAY from Chiang Mai Thailand!! CLICKING ON ANY UNDERLINED TEXT WILL BRING YOU TO MUCH MORE INFO AND FACTOIDS! Sawadee from CHIANG MAI THAILAND!!!! This is the first day of the Lunar New Year as well as Valentines Day!!! Talk about auspicious!!! 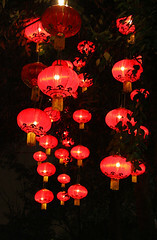 Even though we are in Thailand, Chinese New Year is still celebrated with great enthusiasm here. Red is the color of the day and lots of drums and cymbals are the sounds. Firecrackers are a popular past time too!!! “It boasts an inviting residential ambiance that combines an authentic neighborhood vibe with the modern comforts. Baan Orapin is where you will find genuine ambience of a northern Thai home.” Our plan is to get our bearings today and hopefully take in a Chinese New Year celebration or two AND chillin by the stunning poolside!!! It’s no secret I ADORE Chinese New Year. This is the YEAR OF THE TIGER according the the Chinese Lunar New Year Calendar. ABOVE: MEG LOOOOOOOOVES LION DANCING!!! We have a internet house here we can use so I hope to take full advantage of it this week. We will update as soon as I have some new video and pix to post!!! Until I send our next blog post…..check out the audio and video updates below in the meantime to see if anythIng new has popped up! I LOVE YOU STEVE AND MISS YOU TONS! We LUV YOU ALL to Pieces!! Happy Valentines Day! Hope your day was wonderful even if Steve wasn’t along. I love the Lion Dance. My Norm used to be part of that in the DoJo he belonged to. Your hotel looks lovely. Happy shopping. Happy Valentine’s Day! Happy Chinese New Year! Thanks for showing us Lion Dancing…it was like being a part of the Chinese New Year celebration! WOW…what an absolutely gorgeous Bed and Breakfast! Keep having a blast!